Albuquerque, New Mexico. 23 March 2015: Optomec, a leading global supplier of production grade additive manufacturing systems for 3D printed metals and printed electronics, today announced its CEO, Dave Ramahi, presented at the recent Piper Jaffray Technology, Media and Telecommunications (TMT) Conference, March 10 – 11, 2015 in New York City. Bringing together industry leaders, investors and upstarts, this annual meeting covers the disruptive technologies shaping our daily lives and the companies leading this transformation. Mr. Ramahi participated in a panel discussion on “Applications for 3D Metal Printers,” hosted by Mr. Troy Jenson, managing director and senior research analyst at Piper Jaffray. Mr. Ramahi highlighted how 3D printing and additive manufacturing are transforming the manufacturing industry, by not only enabling the printing of structural metal but also the printing of conductive metals used in electronic applications. He also discussed the company’s new modular LENS Print Engine which can be integrated with new or vintage metal working platforms such as CNC mills, lathes, robots, custom gantries, or table system. Combined with a CNC machine tool, the LENS Print Engine simplifies metal fabrication applications such as net shape rapid prototyping, hybrid manufacturing, full production, in-situ repair, remanufacturing and more. The Piper Jaffray TMT Conference will encompass key themes from across the technology ecosystem, including opportunities in 3D printing, cloud computing, the Internet of Things, wearable technology, big data & analytics, the sharing economy, mobile/social, content delivery & consumption, the optical upgrade cycle, connected cars, next-generation security & storage architectures, software-defined networking, electronic & alternative payments, business & learning services, semiconductor intellectual property, over-the-top content and other emerging developments. 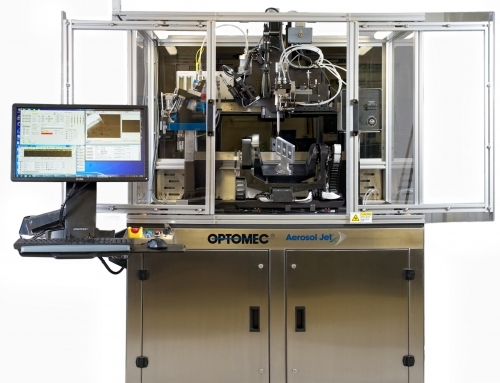 Optomec is a privately-held, rapidly growing supplier of Additive Manufacturing systems. Optomec’s patented Aerosol Jet Systems for printed electronics and LENS 3D Printers for metal components are used by industry to reduce product cost and improve performance. Together, these unique printing solutions work with the broadest spectrum of functional materials, ranging from electronic inks to structural metals and even biological matter. Optomec has more than 175 marquee customers around the world, targeting production applications in the Electronics, Energy, Life Sciences and Aerospace industries. For more information about Optomec, visit https://www.optomec.com/.